Yesterday I did quite a bit of sewing and, uncharacteristically, took loads and loads of photos. But when I looked at them later I found them distinctly unedifying. I can see what I am doing in them and why but since I am still en route, rather than arriving at the destination, it mostly just looks a bit of a mess. So I thought, instead of inflicting that on anybody else, I would have a go at a post that's been ambling about my brain for a while now, about the pleasure of working with recycled clothing. This year I challenged myself to start with a pull of shirting for every project. I didn't say anything about initially as I wasn't sure it was workable, but turns out it is and more than that, I am learning lots through this approach. I particularly enjoy the challenge of pulling out quilting cottons to go with a pile of shirts and I like the character that including the recycled material seems to give. One of the totally unexpected side benefits of working like this is the pleasure I get, as I take a piece of clothing to pieces, from noting all the small details. Pockets, cuffs, collars seams are all fruitful ground. so I've had a dig around in my shirt bag and found a few to share. and this little detail at the bottom of the side seams. I like that while using a tape across the seam where the collar joins the body of the shirt is common practice, every tape is different. And I like that even the most practical of checks can hide a little flower or two. I particularly like the shirts where the underside of the collar is different from the top. Best of all I like that by the time I have dismantled something and noticed all these small touches, I feel more connected to the fabric that I am going to work with. It may just be fanciful but it seems easier to work with something that I have got to know in this way: there's something very comforting and familiar about it all. There is an element of feeling like an archaeologist and explorer to this method. Thank you for noticing and sharing these small details! I love using old shirts in my quilts... I find them at thrift stores, recruit them from friends.. (if you ever get tired of that shirt, wear out the elbows etc..., I would love to use it in a quilt.) There is something special about the stories the cloth holds, even if we don't know them.. I love the tape on the inside collar, too. And I enjoy all the markings you've found. I'll start looking more carefully. I love seeing the tape on the inside collars too. Have often wondered how it could be used in quilting! I'm enjoying seeing you work with the shirtings. It's making me want to pay more attention to the shirts I throw away and maybe see if more will work into my quilting than the very few I've introduced in the past years. And like you said, it's a good source for plaids and checks. Great post, I'm now inspired to have another look for shirts. So far I haven't been able to find much variation in their colours, but I'll be looking more closely for distinguishing details now! I'm so with you on including recycled bits in quilts. I remember you were sewing with old linen pants years ago. I've never noticed the tape ribbon bits though, I'm so going to run off and have a better look at my shirt stash. Great post. I want to start exploring recycled fabrics too. Thoughtful post - thank you!! Kaja, this is a fun post. It's neat to see the details gathered together like this. Saturday I went to get my hair cut and it was all I could do to not go to the Goodwill store and look at men's shirts. I don't need to add to my stash right now, but I like those strips and plaids too! When I recently took apart those jeans, I saved all the labels. There is one pair of jeans that has a few holes in them and I will use the labels to patch the holes. What I have left I will sew somewhere on the quilt. I'm really taken with those details. I don't remember seeing them in shirts. Maybe I haven't seen many high quality shirts? Do you stick to purely cotton shirts or do you use other fibers as well? What a fun way to start a quilt - with a shirt pull. 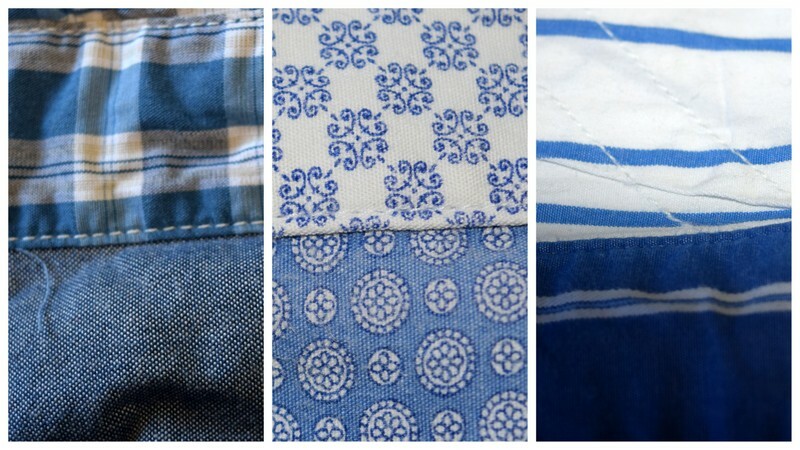 My shirts stay separately in quilts...never thought of combining them with other fabrics for some strange reason. Fun shirt details too. So far I haven't come across any fun things like that in shirts. I have a lot of silk men's ties that have some fun details though! I don't often use shirting for quilting anymore, but I used quite a bit when I first started quilting. I've also taken apart many items of clothing to use as patterns. I learned all sorts of professional sewing and tailoring techniques that way. Of course, I was taught to save every button, zipper, elastic, tape, all of it. I remember mining old clothes for my mom when I was young. I still mine clothes, which means I have a huge stash of every conceivable garment and home dec item, but while I occasionally sew garments, I'd much rather quilt. Thanks for an enlightening post. Inspiring post! My stash is now down to scraps but I do have a big bag of shirts I've collected. Deconstructing is next on my list.